Lisa is a well known and beloved community member and fantastic farmer living and farming in the Santa Ana Valley just east of Hollister. She raises natural, pasture grown chickens and turkeys as well as goats and lamb and produces hand spun cashmere and merino yarns available in natural colors or dyed to suit. Bay Area aficianados treasure Lisa’s pasture raised chicken eggs for their color, vibrancy and unique provenance. CSA San Francisco members look forward to weekly deliveries of farm fresh eggs and beautiful, truly free range chickens from this dynamic, enthusiastic farmer. 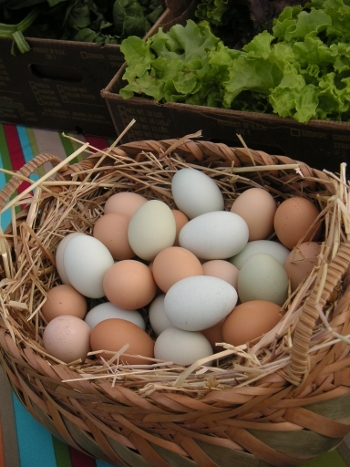 >>Click Here for Information on Ordering Pastured Raised Eggs and Chickens!